I was delighted to meet Ian Fraser the other day, an award-winning journalist and author of Shredded: Inside RBS, The Bank That Broke Britain. We compared our respective wounds received as journalists kicking outside of the usual confines of our chosen professional activity – an all-too-rare breath of fresh air for me. We did one another the favour of paying cash for our respective books accompanied with promises to read and review the other’s output. Ian came good, way ahead of me, doing me the following review on Amazon. I am delighted by his enthusiasm for the book while also being cheered by his references to the likes of the ex-Telegraph columnist Peter Oborne as proof of the ongoing relevance of its arguments about democracy and journalism. If I could be so ungrateful, my sole, additional wish would be to encourage anyone who is moved to buy a hard copy to do so via the more independently minded book retailer Hive.co.uk rather than adding to the tax-phobic coffers of Bezos and co.
There’s also the PDF version that you can download for free from here. Whatever you do, this is the review – many thanks again Ian. Patrick Chalmers has written an important and timely book. Building on his experience as a Reuters correspondent in London, Brussels and Kuala Lumpur, he lifts the lid on the subtle and pervasive bias of our mainstream media. He outlines how this bias can include self-censorship, journalists allowing themselves to be “co-opted” by the rich and powerful, the cozying up of media to major advertisers (as we saw with Peter Oborne’s recent revelations that the Daily Telegraph either removed, toned down or failed altogether to cover negative stories about major advertiser HSBC) and the “spiking” of stories that undermine media proprietors’ prevailing pro-globalisation, neo-liberal agenda. The chapters on the frustrations he felt as a Reuters correspondent trying to provide balanced coverage of the European Union, of dusty corners of the financial markets and of the attempts of Malaysian prime minister Mahathir bin Mohamad to resist the “Washington Consensus” are particularly good. Patrick argues that the mainstream media in the West, as well as global news outfits such as Reuters and Bloomberg (whose journalism is largely funded by the leasing of data terminals to the finance sector), now see their role as being to buttress a failed economic ideology and to pander to an often corrupt elite. As such, he says they have become a pernicious influence that’s obstructing understanding and democracy. The lack of scepticism that most journalists display for international trade treaties like TTIP and unaccountable EU decision-making processes are just two of the areas of media failure covered in the book. Readers, listeners and viewers are being badly let down, writes Chalmers, adding that by amplifying ‘spin’, the media has unleashed a dangerous tide of misinformation that threatens to engulf our democracies. Chalmers ends on a positive note. In his conclusion, he examines how as a result of, among other things, the rise of social media and the internet, it has never been easier for civil society and public-interest journalists to develop a more ethical, balanced and responsible approach to covering the news. He provides examples of the rise of alternative channels of communication that bypass the mainstream media, arguing that these are much more capable of challenging our dangerously flawed governance structures than the media we grew up with. 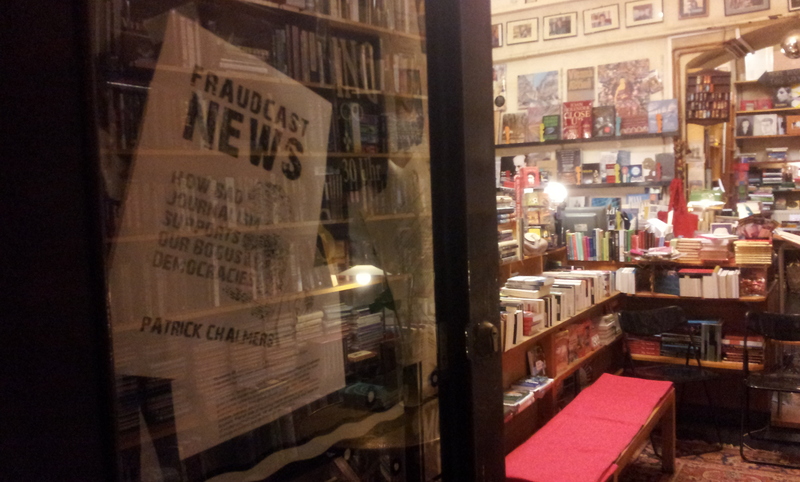 Fraudcast News has been out and about for three years now, making its way into the world without the benefits of a conventional publishing push behind. Without me exactly knowing how – the free PDF has been downloaded more than 10,000 times now and I’ve managed to sell a few hundred paperback copies both online and face to face. Promotional work has been somewhat haphazard – depending on my attention and energy levels. Probably the best means of all has been by doing book readings – organised on the hoof on my own or with fellow enthusiasts for improving journalism and governance practices. 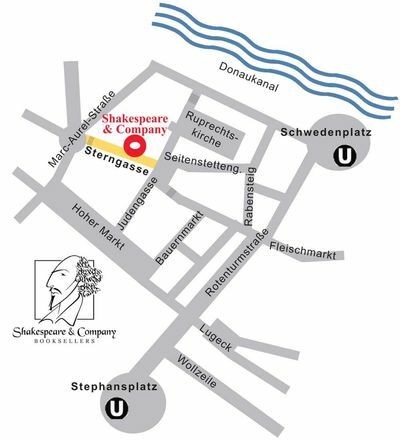 Last Thursday, during a visit to meet Professor Clive Spash, Chair of Public Policy and Governance at WU Vienna University of Economics and Business, I had a chance to do a reading at the bookshop Shakespeare and Co in Vienna’s Sterngasse street. It was one of the most stimulating and enjoyable I’ve done – a lively audience of 30 or so people slotted in among the books and tables of this great venue. 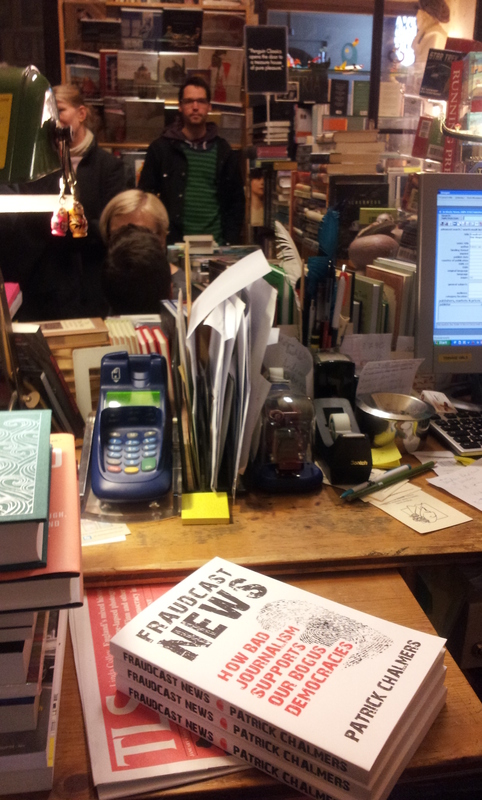 It’s a reminder of what independent bookshops can be. Writing a book is a solitary experience, meaning successful readings such as this one are a treat. There were some excellent questions from the floor and what seemed like some genuine engagement and exchange of ideas. 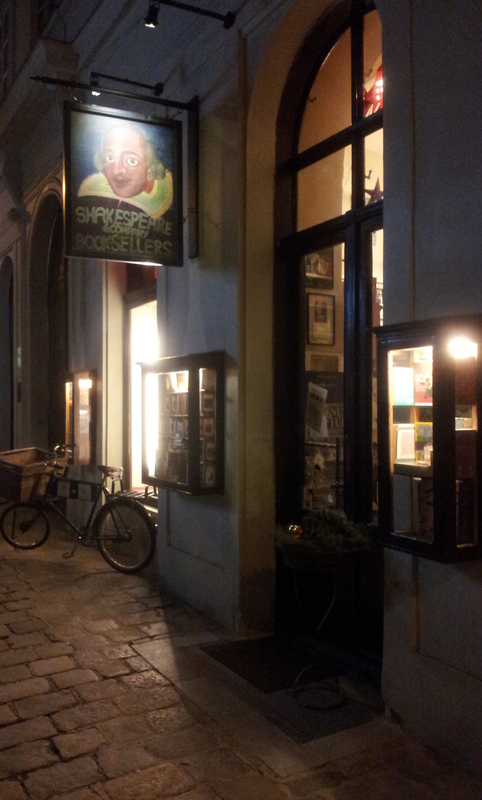 So – if you’re in Vienna and you fancy some English-language reading material then I would recommend Shakespeare and Co. Its eclectic mix of books had me hooked – I’d have been happy to spend the evening browsing if it hadn’t been for having to do the reading. I was delighted to get a full review of Fraudcast News in a recent issue of The Friend magazine. Below is an excerpt while this a link through to the complete article. An article by Elizabeth Redfern that appeared in the 4th July 2014 edition of the Friend. Press corruption is sadly a subject we’re now familiar with, from the press’s own coverage of the Leveson Inquiry and more recently the trial of Rebekah Brooks, Andy Coulson and others, who – in what might become the longest criminal trial in English history – are charged with phone hacking at the now-defunct News of the World tabloid. It would be nice to think that this is an unfortunate blip in an otherwise sparkling British press history. Certainly I hadn’t taken much notice of the inquiry or court case until I’d started to read Patrick’s book, when some familiar words started to nag at me. 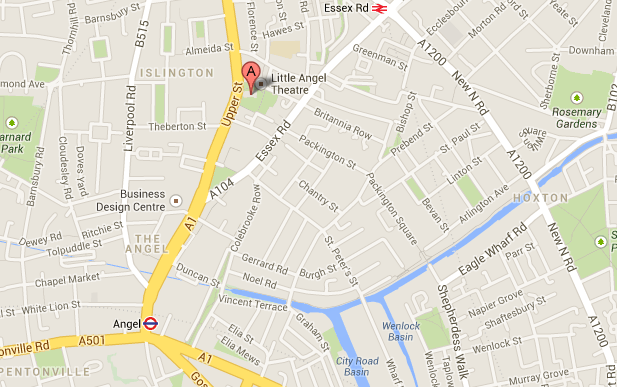 St Mary’s Community Centre, Upper Street, Islington N1 2TX. When Patrick Chalmers hit on becoming a foreign news correspondent, he dreamed of somehow helping advance the cause of social justice around the world. When he eventually landed that dream job, he soon realised it had little to do with improving people’s lives. So he quit to work out where he’d gone wrong, in the process transforming himself into an author, activist and campaigner for better media and governance structures. Among the results was Fraudcast News – How Bad Journalism Supports Our Bogus Democracies published in paperback and as a free PDF download. Patrick will read from the book and discuss how it relates to current political events at all levels, ranging from climate change inaction, renewed conflict in Iraq, Scottish independence or the rise of UKIP. I’ve let my thinking about Julian Assange and Wikileaks swing one way and then the other in the last 10 days – and make no apologies for what you might call being quick to change position but I’d rather say is being open minded. The work done by Wikileaks and its founder is so important that it bears time and attention to work out what’s going on as best we can. Assange’s publisher Colin Robinson added some excellent perspective today in the Guardian, following on from what was a lengthy but revealing and insightful recent piece by would-be Assange ghost writer Andrew O’Hagan. It prompted me to write the following comment in response to the Guardian piece. Great to have this counter point to O’Hagan’s piece – this is valuable material. O’Hagan’s LRB piece is no part of an organised dirty tricks campaign. But by focusing as it does on Assange’s character defects, it ends up serving much the same purpose. O’Hagan’s piece is essential to understanding where all the confusion arises from in all things Assange. I read it as a huge admirer of what Assange has achieved. I concluded it thinking that Wikileaks and/or its founder were done – too difficult to work with to the point of taking themselves out of the equation on these issues. Your piece has re-opened my thoughts on this – so I’m grateful for that. Must get my copy of Cypherpunks. Dare Scots take heed of Lesley Riddoch? 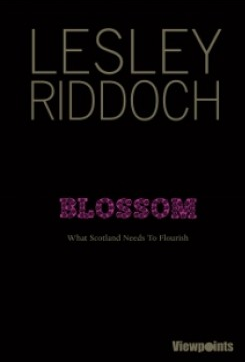 I went for “Blossom : What Scotland Needs To Flourish” by Lesley Riddoch, a gem of a book that had me both laughing and despairing as I raced through its insightful pages about my native land. This was my review, one in a long list of great books chosen by GLW writers, contributors and others. I’ll be reading well into the new year at this rate. Lesley Riddoch is the sort of life-long friend everyone needs – the one to warn you against making a total berk of yourself just as you thought you were looking pretty sharp. In Blossom : What Scotland Needs To Flourish, the lucky beneficiary of her advice isn’t a single person but an entire nation. Riddoch chides her fellow Scots for their timorous beastiness in the face of what is a truly rare moment – the chance for a straight-out vote on regaining independence. Her book channels the Renton character in Trainspotting to tell potential voters they’ve more to fear from themselves than any supposed auld enemy to the South. Her work stares straight into causes and effects of severe poverty and inequality in Scotland, not least the health statistics so truly awful they’ve earned infamy as “the Scottish effect”. Somehow she’s also truly funny.